Khevsureti is a historical-ethnographic region in eastern Georgia. It’s the most mysterious region with almost 3000 inhabitants, who some believe that they are the last descendants of the Crusaders. They are the branch of Kartvelian (Georgian) people located along both the northern (Pirikita khevsureti) and southern (Piraketa khevsureti) slopes of the Great Caucasus Mountains. 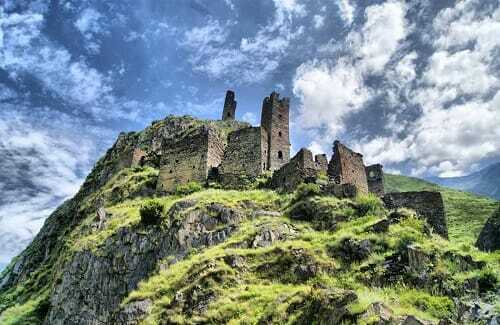 Khevsureti borders with Chechnya in the north, Through Khevsureti run steep valleys overlooked by ancient fortresses. In this tour you have a possibility to see: Shatili (UNESCO World heritage site with 60 towers), Mutso (Medieval village) Abudelauri lakes (three lakes: green, blue and white), Roshka and the most beautiful untouched nature in Caucasus mountains of Georgia. 16:00 – Datvijvari Pass , At an altitude of 2676 m.